Brearley & Co has been established for over 30 years in Swinton, Mexborough and offers a range of added value services for businesses including payroll, taxation and corporate accounts. The accountancy firm continues to expand and turnover has doubled in the last nine years with the success coming from working with clients during their trading year to help them manage their business and tax liabilities. Preparing management accounts for clients helps this process. The HMRC's move to a fully digital based tax system is also having an impact with Brearley & Co advising businesses on how to deal with the requirements of the Making Tax Digital initiative. Established in 1984 by the firm's founder, Giles Brearley, Brearley & Co has grown from a single room to five buildings at its head office on Bridge Street and a single building at Laughton Road Dinnington. 2018 saw the firm expand its presence in the borough by taking on new premises in Rotherham town centre. There are now five partners within the practice, each with their own specialist skills. 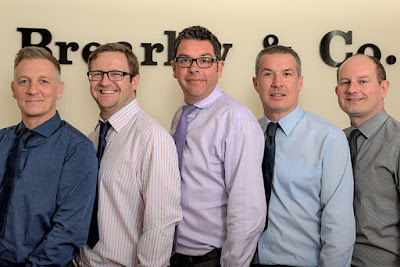 Pictured, left to right: John Hesselden, Alex Brearley, Mark Smallman, Michael Race and Alan Cotton. Read about Brearley & Co on Rothbiz here.